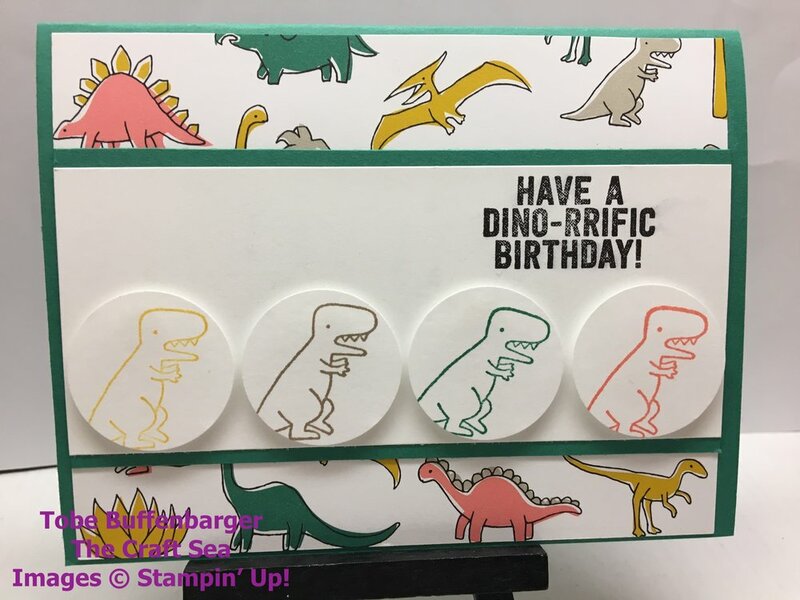 Step it Up / All Occasions / Birthday Cards - You Pick! You pick the class! You can choose from All Occasions, Step It Up, Birthday cards, or a mix. We will be making 4 cards for the material fee of $15. Material Fee: $15 due in the beginning of the class (cash or check). Bring your favorite adhesive and tools. If you don't have any, don't worry! I have extras to use during class. All the materials will be pre-cut so all you have to do is simple stamping, die cutting and assemble the cards together. We will learn various simple techniques and use the Big Shot to add some WOW factors to your creations. The last day to RSVP for this class is 2 days before so I can prepare enough material for everyone. If you cancel after the RSVP deadline, you will still be responsible for the fee ($15) before you can attend another class with us – strict policy will be enforced. We appreciated your consideration to our time/efforts to make this fun for everyone. House notes: There are four steps leading from the front door to the crafting area. We do not smoke or have pets. However, we do have two small children that will be playing nearby. Join me at Panera for an afternoon of coffee and cards. If you are new to our group this will be a great first event to meet us and see what we are about! You will be able to make a FREE make & take card and enjoy the fun of making a card on your own!! All the material will be provided for you so just bring yourself and your friends to join the fun, even if you only have 30 mins to spare! Panera offers a variety of pastries, sandwiches and beverages so come and grab a coffee with me and make a card!! Let me know if you have any questions and see you there! Birthday cards are always needed in every crafter's stash. Let's fill up ours with some great designs! 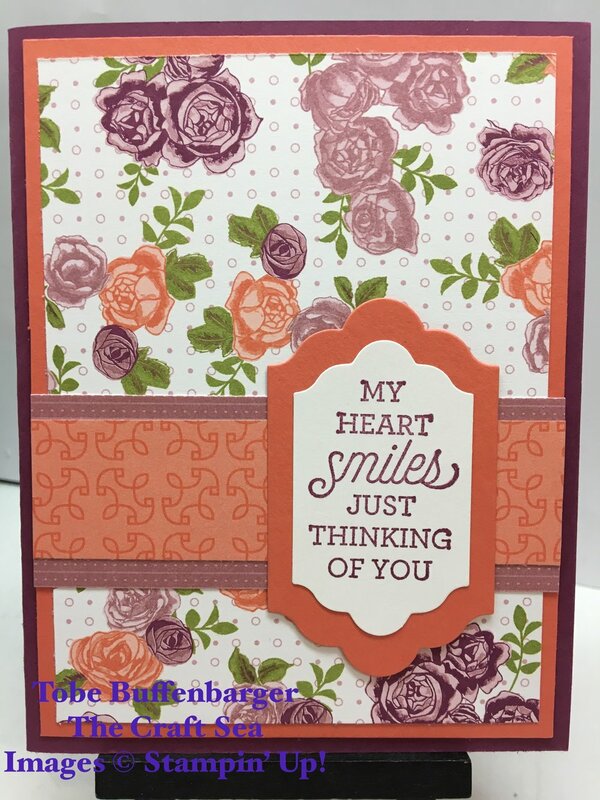 We will make four cards featuring a variety of styles and sentiments (as always specific sentiments can be switched out). Beginners are welcome! Are your card reserves empty after the Holiday season? This is the class for you! We will make four cards featuring a variety of styles and sentiments (as always specific sentiments can be switched out). We will be using of the new Occasions Catalog products as well as some old favorites. Beginners are welcome! 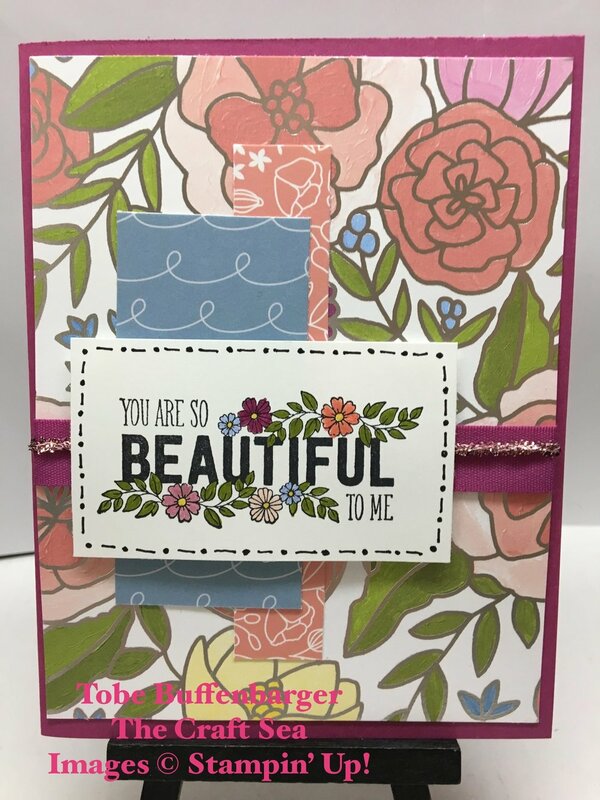 What's better than learning a new and fun technique for your card making? Nothing I say! For this class, we will making two different designed cards once and then making them again but stepping them up! Beginners are welcome! Join me for a fun day of free crafting! Bring your projects to work on or just come to hang out and see all the new goodies. I will have my tools (dies, punches, BIg Shot) available to use. -- Tons of yard sale items! Bring your friends! If coming, please consider bringing a snack to share. I will order pizza for anyone that wants to pitch in a few dollars. We do not have pets or smoke. There are about 5 steps from front door to craft area. Through the month of November, I'm celebrating Christmas! 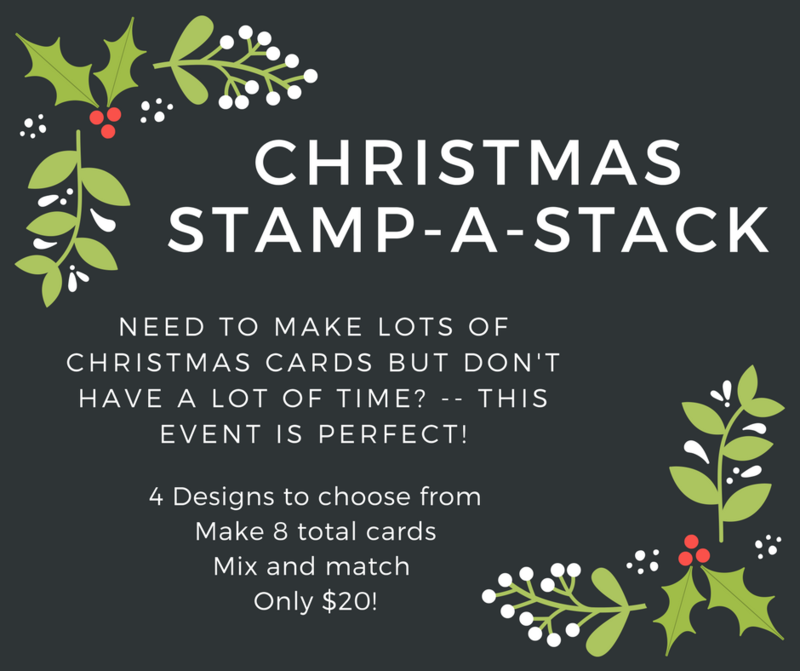 For $20, you will make 8 Christmas cards to send! To make this class even greater, there will be 8 designs to choose from! Mix and match from a variety of styles and designs. We will be using current Holiday Catalog products as well as some old favorites! Bring your favorite adhesive, otherwise, gluesticks will be provided in class. All the materials will be pre-cut so all you have to do is simple stamping, die cutting and assemble the cards together. We will learn various simple techniques and use Big Shot to add some WOW factors to your creation. The last day to RSVP for this class is 2 days before class so I can prepared enough material for everyone. If you cancel after the RSVP deadline, you will still be responsible for the fee ($) before you can attend another class with us – strict policy will be re-enforced. We appreciated your consideration to our time/efforts to make this fun for everyone. (Exact address will be messaged/emailed 2 days before event. Event will be held at my house.) Join me for my inaugural crafting event in Omaha! I will have a free make n take greeting card using Christmas supplies and $2 card kits to buy and make. Feel free to bring you own crafty project to work on. I have a variety of Stampin' Up! tools available to use. Bring your favorite adhesive and basic crafting tools (scissors, bone folder, etc). I will have basic supplies available if you did not have your own or forget. Come any time between 10am and 4pm. We will have limited snacks, but feel free to bring your own. Who wouldn't like to make new friends and have a group that you get to know better and share laughs with each month while sharing a love of crafting? Even better, building your crafting stash, learning new techniques, making new friends, going home with CUTE projects each month you made yourself. PLUS, getting instructions to create those cards later and once every 6 months, getting extra free crafting goodies to boot! Nice, right? If sounds like a blast to you, then I would like to introduce you to the Stamp Club! A Stamp Club is a way for members to get together on monthly basis for fun new techniques and ideas, to purchase new stamps and supplies and to earn FREE stuff. It's a great way to meet others who share the passion of stamping as much as you! In addition, you can build up your supplies on a budget and get some crafting time once a month ~ who doesn't need THAT?! At each scheduled get-together we'll make four FREE cards or projects for you to take home! We need at least 6 members to make the club work. This club will run for 6 months (January - June 2018) and each member commits to purchasing a minimum of $25 (before shipping & tax) worth of Stampin’ Up! Products at each get-together to build up their craft supplies. The benefit is that each member gets to take a turn at being the "Hostess" and will receive all the hostess benefits of hosting a workshop, without ever having to actually host one or having to place one large order! When it is your turn to be the Hostess, you will be able to have your friends / families place orders with you so you can get bigger discounts! What if I can’t make the Scheduled Meeting? Other option: Come to stamp club and make the projects $15 or free with $25+ order submitted that night. Make sure to email me to let me know of your attendance. Are you a beginner crafter? Or Do you have limited time to make some cards? This class is perfect for you! We will make four cards that are quick and easy. Material Free: $12 due in the beginning of the class (cash or check). Bring your favorite adhesive, otherwise, gluesticks will be provided in class. 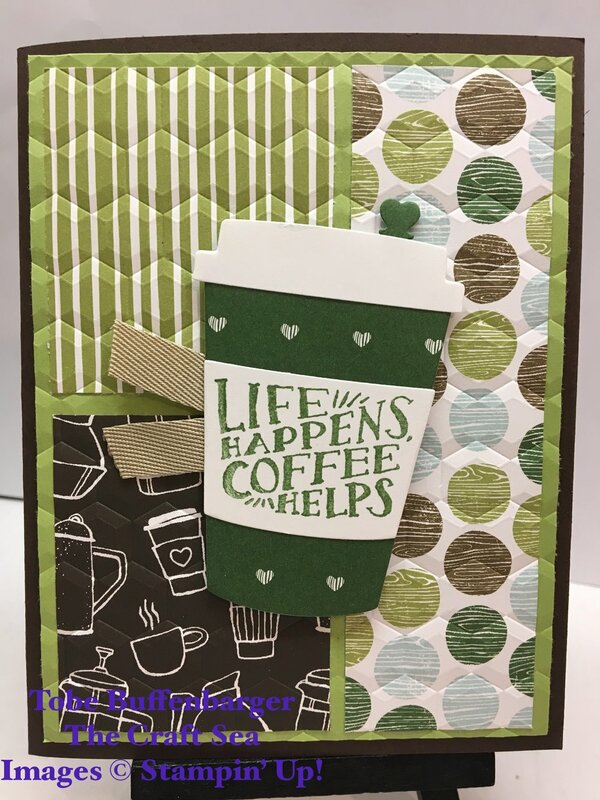 All the materials will be pre-cut so all you have to do is simple stamping, die cutting and assemble the cards together. We will learn various simple techniques and use Big Shot to add some WOW factors to your creation. The last day to RSVP for this class is 2 days before so I can prepared enough material for everyone. If you cancel after the RSVP deadline, you will still be responsible for the fee ($12) before you can attend another class with us – strict policy will be enforced. We appreciated your consideration to our time/efforts to make this fun for everyone. **Do not park on the street. Please park in my driveway or the guest parking spots across the street. Let's play with some different coloring techniques. We will make four cards using Brusho Crystals, Watercolor, Stampin' Blends, and a brayer. Material Free: $15 due in the beginning of the class (cash or check). Bring your favorite adhesive, otherwise, gluesticks will be provided in class. All the materials will be pre-cut so all you have to do is simple stamping, die cutting and assemble the cards together. We will learn various simple techniques and use Big Shot to add some WOW factors to your creation. The last day to RSVP for this class is 2 days before so I can prepared enough material for everyone. If you cancel after the RSVP deadline, you will still be responsible for the fee ($15) before you can attend another class with us – strict policy will be enforced. We appreciated your consideration to our time/efforts to make this fun for everyone. 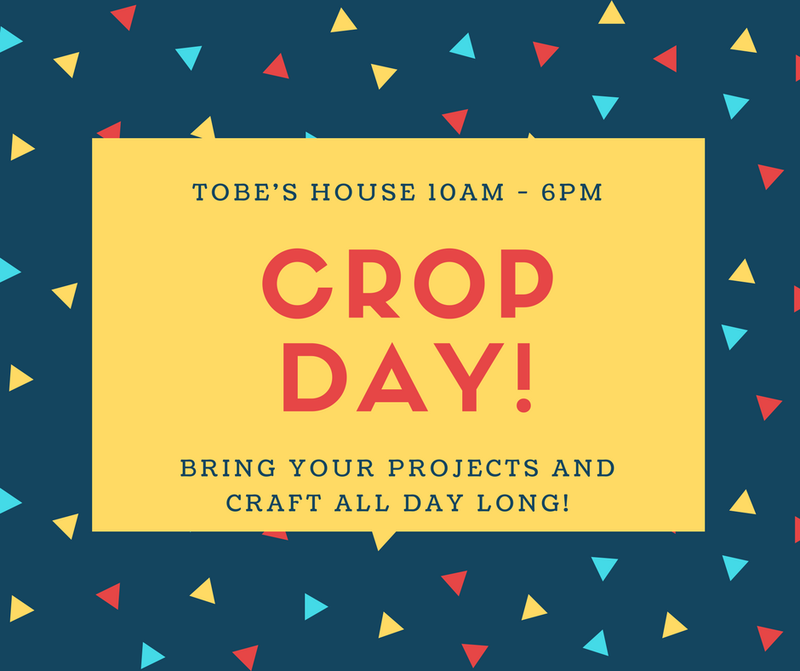 Join me for a fun day of free crafting! Bring your projects to work on. I will have my tools (dies, punches, BIg Shot) available to use. I will also have catalogs on hand to take home and a simple free make n take! As always, I will have $3 card kits to make on-site. **Do not park on the street. Please park in the driveway or in the guest parking across the street. 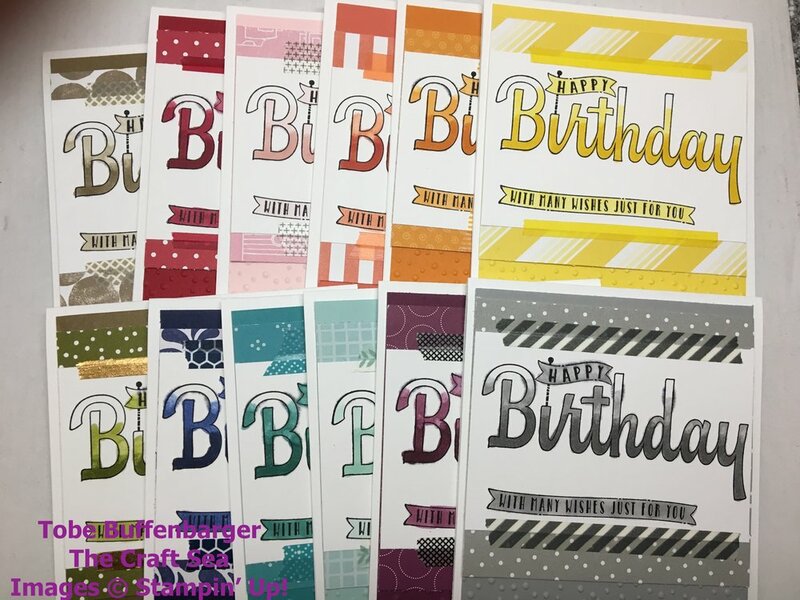 Each of the 4 cards will feature lots of great Stampin' Up patterned paper. This class will feature different designs than the DSP class from February.